abriela Jacobs leaned against a pillar, resting her head on the coral colored wall. A grin spread across her face and her big brown eyes smiled as she guided the next patient to sit at a bench in the San Raymundo clinic. She held a clipboard with a paper numbered from one to about 100. Each time she greeted a new patient coming from intake, the area where patients were admitted and had their blood pressure taken, she would take their number and distribute them throughout the consultation rooms. She would then cross out the number on her paper. Organizing patients wasn’t exactly what Gabriela, 23, came here to do. Usually a translator, she spends days in the clinic during medical missions working with nurses or doctors interpreting medical terminology and patient concerns from Spanish to English and vice versa. Refuge International, a nonprofit organization based in Texas, hires translators to assist with all aspects of communication during their medical missions. Some translators have worked with the nonprofit various times, for others it was the first time. 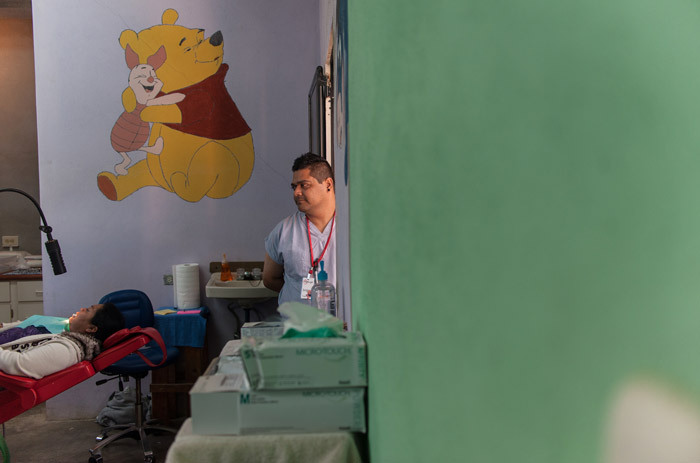 Most have worked in the San Raymundo clinic before, but with other organizations. Translators are responsible for bridging the communication gap between patient and doctor, to ensure patients get the best care possible. Gabriela, a Guatemalan citizen, has translated for nonprofits since she was 15 years old. Since then she has translated in about 20 missions. She learned English in the 7th grade and was encouraged to volunteer as a translator by her English teacher that same year. She said she goes on missions not only to study English, but to give back to her country and her people. Alexandra Morales, also a translator, has known Gabriela since middle school. Unlike Gabriela, who dedicates her free time to work with medical missions, translating is Alexandra’s full time job. Alexandra, 23, has been working as a translator for eight years and has been on so many medical missions that she has lost count. The March 2014 mission was the third time Alexandra had worked with Refuge International. She spent most of her time working alongside nurse practitioners in the clinic. Alexandra said her experience as a translator has allowed her to become more humble and appreciative of what she has. During the mission, she said, there was an 80-year-old man named Angel who taught her the importance of being happy. Jentami Castañeda joined Refuge International for the first time during the March 2014 mission. She has been on about 20 missions, having taken a year off of school. During that year she was dedicated solely to translating, joining one to two organizations per month. She said she has learned something different with every group she has traveled with. But one thing keeps her coming back mission after mission: the people.